Phycoerythrin conjugated Mouse anti Human CD14 antibody, clone Tuk4 (MCA1568PE) used for the evaluation of CD14 expression on bovine monocytes by flow cytometry. From: Pomeroy B, Sipka A, Hussen J, Eger M, Schukken Y, Schuberth HJ. Counts of bovine monocyte subsets prior to calving are predictive for postpartum occurrence of mastitis and metritis. Vet Res. 2017 Feb 21;48(1):13. Published customer image:Mouse anti Human CD14 antibody clone Tük4 (MCA1568) used to evaluate CD14 expression on canine monocytes by flow cytometry. Mouse anti Human CD14 antibody clone Tük4 (MCA1568) used to evaluate CD14 expression on canine monocytes by flow cytometry. Immunophenotyping gating strategy and morphological analysis for MDSC identification in peripheral blood of dogs. PBMCs from healthy dogs and dogs with cancer were stained for the myeloid marker CD11b, monocytic marker CD14 and MHC II. 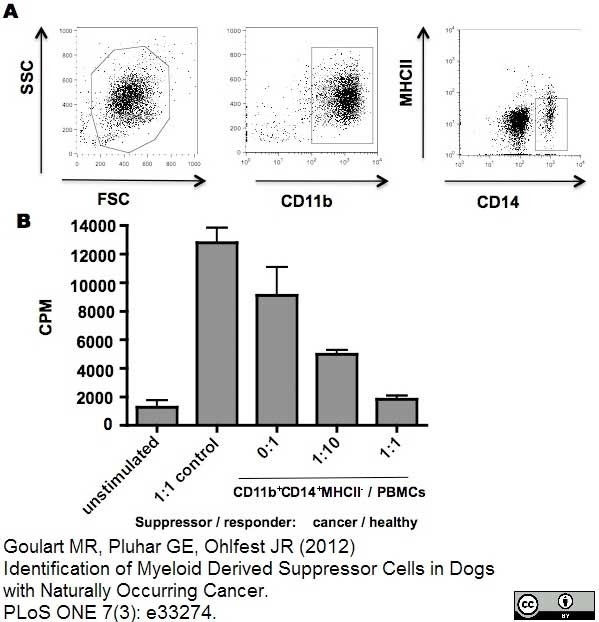 (A) Representative flow cytometric analysis of forward and side scatter and gated CD11b+CD14−MHCII− cells from dogs with advanced or metastatic tumors compared to dogs with early stage non-metastatic tumors and healthy control dogs. Plots are representative of dog with advanced metastatic hemangiosarcoma (top), early stage bladder transitional cell carcinoma (middle) and a healthy dog. (B) FACS sorted CD11b+CD14−MHCII− cells were stained with diff-quick for cell morphology evaluation. A representative example of polymorphonuclear granulocyte morphology of CD11b+CD14−MHCII− cells is shown at 63× magnification. Mouse anti Human CD14 antibody, clone Tük4 (MCA1568) used to identify bovine monocytes in the skin and subcutaneous tissue of adjuvant injected calves by immunofluorescence. Cellular recruitment to skin and subcutaneous tissues. 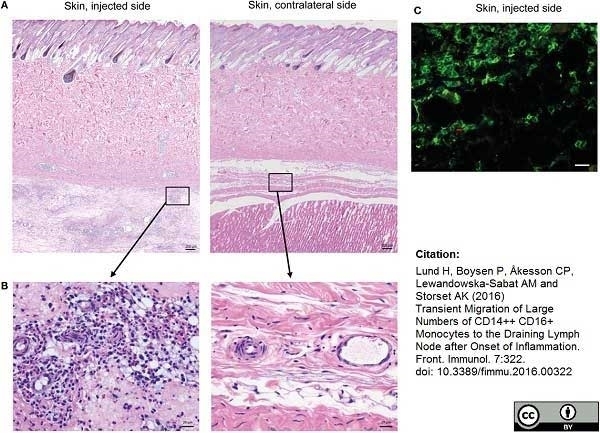 (A) HE stained sections of skin with subcutaneous tissue from the side injected with adjuvant and the contralateral side, at 24 h post-injection. Scale bars: 200 μm. (B) Enlargement of outlined areas in A, as indicated. Scale bars: 20 μm. (C) Immunofluorescent labeling of subcutaneous tissue on the injected side with antibody against CD14 (green). Scale bar: 20 μm. Transient Migration of Large Numbers of CD14++ CD16+ Monocytes to the Draining Lymph Node after Onset of Inflammation. Mouse anti Human CD14 antibody, clone Tük4 (MCA1568) used to identify bovine monocytes in lymph nodes of adjuvant injected calves by immunohistochemistry. Cellular recruitment to lymph nodes (LN) and peripheral blood. (A) LN cells were prepared for FCM analysis and gated on forward/side scatter (FSC/SSC) characteristics. Plots from one representative animal are presented. Panels illustrate the gating of lymphocytes, monocytes, and granulocytes as indicated and in the draining LN (left) and the contralateral LN (right), at 24 h post-injection. (B) Percentages of major immune cell populations in LNs, based on the gating strategy in A. Horizontal stacked bars show mean percentages of lymphocytes (gray), monocytes (dark gray), and granulocytes (black) of the total live cell population in non-injected animals (n = 6) and at different time points after adjuvant injection (n = 2–3). (C) IHC labeling of draining and contralateral LNs at 24 h post-injection with antibody against CD14. Different regions of the LN are indicated. (D) Cellular differential counts in peripheral blood. Horizontal stacked bars show mean absolute numbers (×109) of lymphocytes (gray), monocytes (dark gray), and granulocytes (black) at pre-injection and at different time points after adjuvant injection. Mouse anti Human CD14 antibody, clone Tük4 (MCA1568) used to identify bovine monocytes in lymph nodes of adjuvant injected calves by immunofluorescence. Distribution of monocytes in the LNs. Immunofluorescent labeling of LNs with antibodies against CD14 (green), CD21 (blue), and Ki67 (red). CD21 stains the LN follicles. (A) CD14+ cells were present in the capsule, subcapsular sinus, peri-trabecular sinus, and interfollicular areas of the draining LN at 24 h post-injection. (B) The contralateral LN was mainly devoid of CD14+ cells. Note the empty sub capsular sinus and trabecular sinus areas, as opposed to the infiltration in (A). (C) CD14+ cells were abundant in the capsule, but were decreased in numbers in the sinus and the cortex at 48 h post-injection. 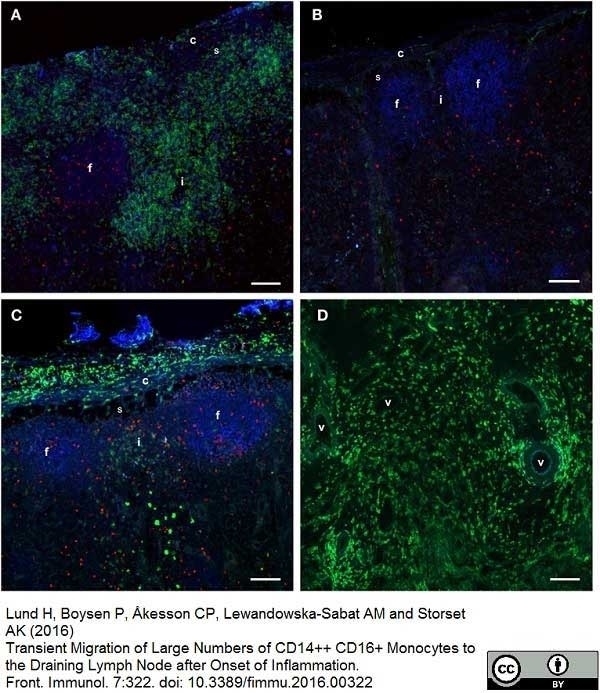 (D) CD14+ cells were present in the medulla of the LN at 48 h post-injection, and particularly around vessels. Follicle (f), interfollicular area (i), capsule (c), sinus area (s), vessel (v). Scale bars: 100 μm. Mouse anti Human CD14 antibody, clone Tük4 (MCA1568) used to identify bovine monocytes and Mouse anti Bovine CD205 (MCA1651GA) to identify dendritic cells in lymph nodes and subcutaneous tissue of adjuvant injected calves by immunofluorescence. 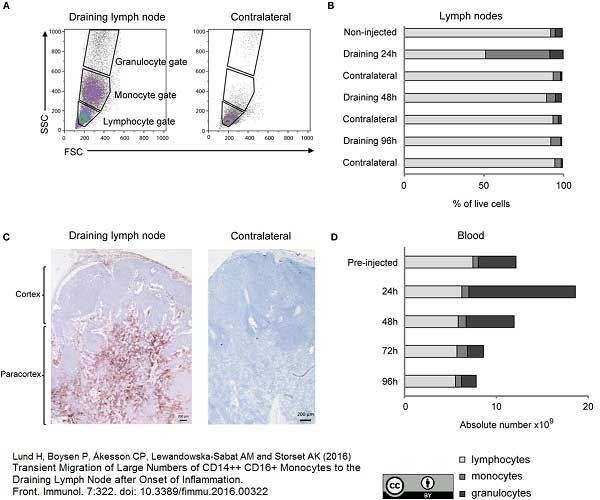 Distribution of monocyte and DC markers in skin and LNs. Immunofluorescent labeling of subcutaneous tissues and LNs with antibodies against CD14 (green), CD205 (red) and CD11c (blue), at 24 h post-injection. (A) Large numbers of CD14+ cells were observed in the subcutis on the injected side. Note the separation of collagen bundles (appears as gray auto fluorescence, arrowheads) due to inflammatory infiltrates. A limited number of CD205+ cells were present. (B) A few CD14+ cells (arrow) were observed on the contralateral side. 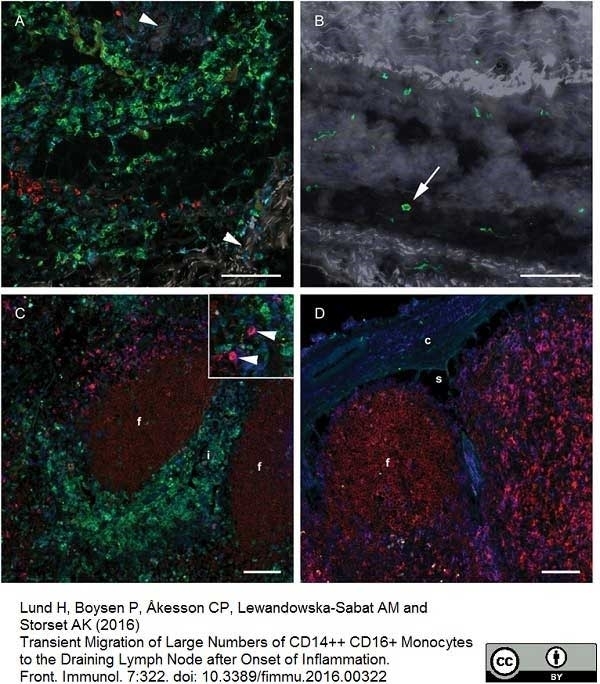 (C) CD14+ cells infiltrated the interfollicular areas of the cortex of the draining LN. A moderate amount of CD205+ CD11c+ DCs were observed (arrow heads in insert). (D) CD14+ cells were sparsely present in the contralateral LN. CD205+ follicles were surrounded by CD11c single labeled and CD11c+ CD205+ double labeled cells. Follicle (f), interfollicular area (i), capsule (c), sinus area (s). Scale bars: 100 μm. 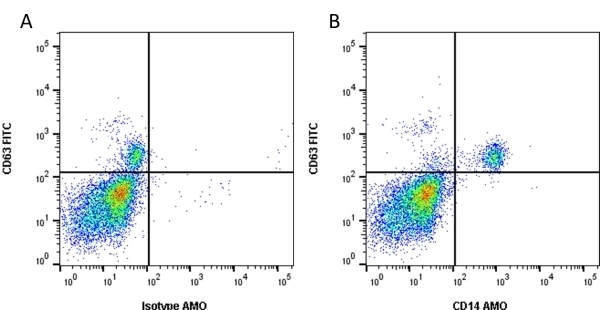 RPE-AlexaFluor647 tandem conjugated Mouse anti Human CD14 antibody, clone Tük4 (MCA1568P647) used to identify CD14 expressing mononuclear cells in peripheral blood samples by flow cytometery. (A) Representative dot plots of PBMC of NSCLC patients (CA) and normal health donors (NC). 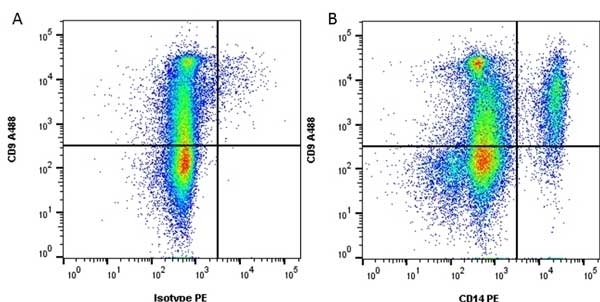 Non-lymphocyte mononuclear cell was gated, and CD11b+CD14+ S100A9+ cells were analyzed by flow cytometry. (B) Ratio of CD11b+CD14+ S100A9+ cells in PBMC of health donors (NC, n = 7) and NSCLC patients (CA, n = 58). (C) Clinical response of EGFR-TKI treatment and peripheral blood CD11b+CD14+ S100A9+ MDSCs, CR+PR, n = 46; SD+ PD, n = 12. (D) CD11b+CD14+ S100A9+ difference between DCB and NCB groups in training cohort. (DCB, n = 19; NCB, n = 6, p = 0.0007) (E) CD11b+CD14+ S100A9+ difference between DCB and NCB groups in validation cohort. (DCB, n = 26; NCB, n = 7, p = 0.06) (F–H) Kaplain-Meier curve of PFS according to median percentage of CD11b+CD14+S100A9+ in training cohort, validation cohort and all cases. Dark line: CD11b+CD14+S100A9+ ≤18.9% in PBMC, dashed line: CD11b+CD14+S100A9+ >18.9%. All data express as mean ±SD, * p <0.05; CR: complete response, PR: partial response, SD: stable disease, PD: progress disease, DCB: durable clinical benefit, NDB: non-durable benefit. From: Feng PH, Yu CT, Chen KY, Luo CS, Wu SM, Liu CY, Kuo LW, Chan YF, Chen TT, Chang CC, Lee CN, Chuang HC, Lin CF, Han CL, Lee WH, Lee KY.
S100A9(+) MDSC and TAM-mediated EGFR-TKI resistance in lung adenocarcinoma: the role of RELB. Mouse anti human CD14 antibody, clone TÜK4 recognizes the human CD14 cell surface antigen. CD14 is a ~55 kDa glycoprotein that contains multiple leucine-rich repeats. It is anchored to the cell membrane via a glycosylphosphatidylinositol (GPI) linkage (Simmons et al. 1989), a soluble form of CD14 also exists (Bazil et al. 1986). CD14 is strongly expressed on the surface of monocytes and macrophages but has also been shown to be expressed on the surface of non-myeloid cells (Jersmann 2005). CD14 functions as a pattern recognition receptor (Pugin et al. 1994, Dziarski et al. 1998) in innate immunity for a variety of ligands, in particular for the LPS (endotoxin) of Gram-negative bacteria. Mouse anti human CD14 antibody, clone TÜK4 has been shown to block SDF-induced chemotaxis of U937 cells in a dose –dependent manner (Yang et al. 2003). Use of the anti-human CD14 antibody, Low Endotoxin format is recommended for this purpose. Soell, M. et al. (1995) Activation of human monocytes by streptococcal rhamnose glucose polymers is mediated by CD14 antigen, and mannan binding protein inhibits TNF-alpha release. J Immunol. 154 (2): 851-60. Gupta, V.K. et al. 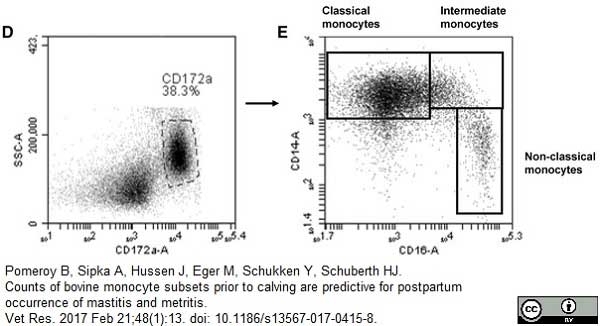 (1996) Identification of the sheep homologue of the monocyte cell surface molecule--CD14. Vet Immunol Immunopathol. 51 (1-2): 89-99. Sopp, P. & Howard, C.J. (1997) Cross-reactivity of monoclonal antibodies to defined human leucocyte differentiation antigens with bovine cells. Vet Immunol Immunopathol. 56 (1-2): 11-25. Willett, B.J. et al. (2003) Expression of CXCR4 on feline peripheral blood mononuclear cells: effect of feline immunodeficiency virus infection. J Virol. 77 (1): 709-12. Werling, D. et al. (1998) Analysis of the phenotype and phagocytic activity of monocytes/macrophages from cattle infected with the bovine leukaemia virus. Vet Immunol Immunopathol. 62 (3): 185-95. Yang, H. et al. (2003) Antibody to CD14 like CXCR4-specific antibody 12G5 could inhibit CXCR4-dependent chemotaxis and HIV Env-mediated cell fusion. Immunol Lett. 88 (1): 27-30. Jacobsen, C.N. et al. (1993) Reactivities of 20 anti-human monoclonal antibodies with leucocytes from ten different animal species. Vet Immunol Immunopathol. 39 (4): 461-6. Dalli J et al. (2008) Annexin 1 mediates the rapid anti-inflammatory effects of neutrophil-derived microparticles. Lybeck, K.R. et al. (2009) Neutralization of interleukin-10 from CD14(+) monocytes enhances gamma interferon production in peripheral blood mononuclear cells from Mycobacterium avium subsp. paratuberculosis-infected goats. Clin. Vaccine. Immunol. 16: 1003-11. Willett, B.J. et al. (2007) Probing the interaction between feline immunodeficiency virus and CD134 by using the novel monoclonal antibody 7D6 and the CD134 (Ox40) ligand. Krueger, L.A. et al. (2016) Gamma delta T cells are early responders to Mycobacterium avium ssp. paratuberculosis in colostrum-replete Holstein calves. J Dairy Sci. 99 (11): 9040-50. Schaut, R.G. et al. (2015) Bovine viral diarrhea virus type 2 in vivo infection modulates TLR4 responsiveness in differentiated myeloid cells which is associated with decreased MyD88 expression. Pomeroy, B. et al. (2017) Counts of bovine monocyte subsets prior to calving are predictive for postpartum occurrence of mastitis and metritis. Vet Res. 48 (1): 13. Novacco, M. et al. (2016) Prognostic factors in canine acute leukaemias: a retrospective study. Vet Comp Oncol. 14 (4): 409-16. Feng, P.H. et al. (2018) S100A9+ MDSC and TAM-mediated EGFR-TKI resistance in lung adenocarcinoma: the role of RELB. Higgins, J.L. et al. (2018) Cell mediated immune response in goats after experimental challenge with the virulent Brucella melitensis strain 16M and the reduced virulence strain Rev. 1. Vet Immunol Immunopathol. 202: 74-84. Simmons, D. L. et al. (1989) Monocyte antigen CD14 is a phospholipid anchored membrane protein. Bazil, V. et al. (1986) Biochemical characterization of a soluble form of the 53-kDa monocyte surface antigen. Jersmann, H.P. 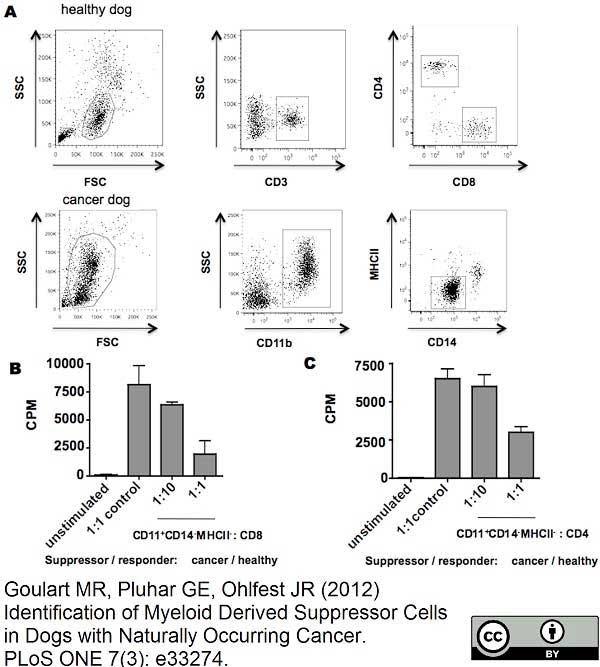 (2005) Time to abandon dogma: CD14 is expressed by non-myeloid lineage cells. Pugin, J. et al. (1994) CD14 is a pattern recognition receptor. Dziarski, R. et al. (1998) Binding of bacterial peptidoglycan to CD14.